Dr. David Croman is a 1999 graduate of the University of Pennsylvania School of Veterinary Medicine, and is currently the Director of Veterinary Services at People For Animals (PFA). 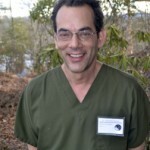 Prior to working at PFA, Dr. Croman worked in private practice and provided veterinary services for South Mountain Wildlife Rehabilitation Center and the Jersey Animal Coalition. When not involved in veterinary medicine, Dr. Croman enjoys hiking with his dog, Jessica, sailing, skiing, and other outdoor sports. Dr. Iris Biely is a 1979 graduate of Rutgers University – Cook College and a 1983 graduate of Purdue University College of Veterinary Medicine. She spent her first 8 years as a veterinarian caring for patients at Antelman’s Animal Hospital in Clifton, NJ. Dr. Biely spent the next 8 years as a surgeon at the Popcorn Park Animal Hospital. Dr. Biely has been performing spay/neuter surgery at People for Animals since the early 1990s, first on a part-time basis and then full-time beginning in 1999. Dr. Biely is very involved in her local church singing every Saturday at mass in the choir. She is also very involved in the riding, training and showing of horses in the sport of dressage and has received numerous local and national awards. Dr. Biely is the companion to four horses: two Hanoverians named Randy and Cooper; Millie, a Dutch Warmblood; and Guy, a Standardbred. Dr. Laurie Heeb is a 1992 graduate of Kansas State University College of Veterinary Medicine. One of her proudest moments in veterinary school was when she became the very first student at Kansas State to receive the “Gentle Doctor” Award. This award is given to veterinary students who demonstrate an extraordinary degree of compassion for animals. Dr. Heeb received her Bachelor of Science in Medical Technology from Fairleigh Dickinson University. She worked for several years in the human medical field before pursuing her career in veterinary medicine. Following her graduation from Kansas State, Dr. Heeb completed a 3-year internship and residency in Clinical Pathology at the Animal Medical Center in New York City. She was a Clinical Pathologist with Antech Diagnostics for 15 years before joining People for Animals in 2011. In addition to being a veterinarian, Dr. Heeb is a Certified Animal Control Officer and Animal Cruelty Investigator. When she’s not helping animals at PFA, Dr. Heeb enjoys spending time with friends and relaxing at home with her cats. Dr. Laura Acost a grew up in South America and obtained her veterinary degree at The Central University of Venezuela in 2000. In the United States, she acquired her USA Veterinary License by completing a year at the Tufts University Cummings School of Veterinary Medicine in 2005. She has worked in private practice with small animals and exotic pets since she graduated and has completed externships and performed volunteer work in various wildlife rehabilitation centers. Dr. Acosta joined the PFA surgical team in 2009 and continues to also work in private practice. When not working, Dr. Acosta spends time with her husband, daughter, two cats, and parrot. She enjoys swimming, bicycling, craftsmanship, and the beach during the summer. Dr. Anne Pierok, a graduate of Rutgers University – Cook College and Cornell University College of Veterinary Medicine, has worked for People for Animals for at least 20 years performing presurgical examinations and providing basic veterinary care at PFA’s Wellness Clinic. Dr. Pierok’s veterinary interests include infectious disease control, cardiology, neurology, emergency medicine, and geriatric care. She has been the companion to numerous shelter cats and dogs over the years, giving them very happy and long lives. Dr. Pierok is currently the companion to an incorrigibly hyperactive but adorable 11-year-old Parson Russell Terrier and a 15-year-old Pit/Boxer/Poodle/Terrier mix who also happens to be one of her most challenging cardiology patients ever. Dr. Pierok encourages people to adopt their companion animals from shelters, get them spayed or neutered, give them loving homes and proper training, and to take good care of them for the rest of their lives. In return, they will give you many years of unconditional love and joy. MORE BIOS & PICTURES COMING SOON!